Solid Surface products are best known for their easy maintenance and their capacity to be resurfaced to keep them looking new. 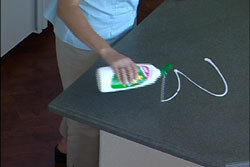 For general daily cleaning you can simply use soapy water or an ammonia-based cleaner. For a more thorough cleaning use a damp cloth and any household detergent, such as Soft Scrub® or Fantastik®. Sealing is not necessary for solid surface products. To remove most stains such as hard water deposits, minor burn marks, and minor scratches use an abrasive cleanser or a 3M Scotch Brite® Pad. 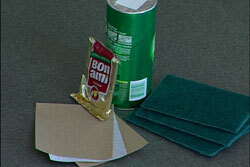 For more stubborn stains and scratches you may use fine sandpaper to resurface your counter eliminating the stain or mark. Be sure to refer to your manufacturer's instructions for the correct sanding process for your counter's finish. As durable as solid surface products are they do have their limits. 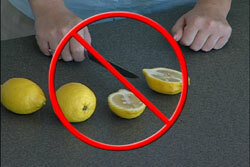 Do not use your new countertop as a cutting board, it will show marks if done directly on the surface. Be sure to use hot pads or trivets when placing hot pots or pans on the countertop. 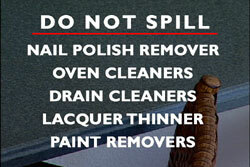 Do not spill nail polish remover, oven cleaners, drain cleaners, lacquer thinner or paint removers on these products, it will stain or discolor the surface. If a spill does occur, quickly flush the surface with water. 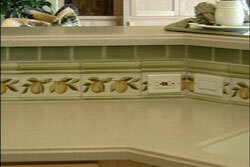 It is the responsibility of the homeowner to maintain the silicone caulked areas, such as where the backsplash and the countertop meet, to prevent any potential discoloration or separation over time.